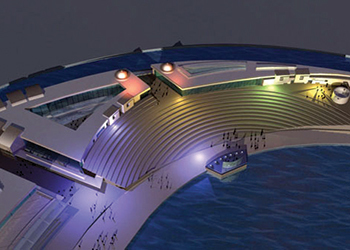 An artist’s impression of the Omagine project. The DA, which has allowed the government and Omagine to enter into the usufruct agreement, was ratified by the Ministry of Finance in March this year, said the report. The Omagine Project is planned to be developed on one million sq m of beachfront land in Seeb, facing the Gulf of Oman just west of the capital Muscat and approximately six miles from Muscat International Airport. The ambitious development will be designed, developed and operated by Omagine LLC, the US-based Omagine’s Oman subsidiary. The signing of the DA and usufruct agreement grants Omagine rights over land constituting the project site, which includes the right to sell such land. The term of the usufruct agreement is 50 years (with five years free of rent) and the RO20,250 ($5,460) usufruct registration fee, which Omagine will pay the Ministry of Housing, is based on the 45-year term of the agreement on which rent is payable. The Omagine Project is planned to be an integration of cultural, heritage, entertainment and residential components including a high-culture theme park containing seven pearl-shaped buildings, each approximately 60 ft in diameter. It will also include associated exhibition buildings, a boardwalk, an open-air amphitheatre and stage; open green areas; a canal and an enclosed harbour and marina area. The development will also feature entertainment venues; boat slips and docking facilities; a four and a five-star resort hotel, and possibly a three or four-star hotel; commercial office buildings; shopping and retail establishments; and approximately 2,100 residences.